Mr. and Mrs. Donald McKinnon, Glen Ora, Nabiac. Catherine Mary McKinnon was born on 31 May 1879 at Glen Ora, Nabiac, N.S.W. and Catherine Ward, on 30 Dec 1911 at Glen Ora, Nabiac, N.S.W. Catherine died on 30 Nov 1962 at Nabiac Hospital, Nabiac, aged 83.
and was buried in Dec 1962 at Failford, Failford, N.S.W. 1. Catherine Anne McMaster was born on 3 Mar 1913 at Taree, N.S.W. 2. Allan Stuart McMaster was born on 21 Apr 1915 at Taree, N.S.W. He married Esme Marjorie Skillen  in 1945 at Sydney, N.S.W. The Northern Champion, 24 march 1945. Presbyterian Church, Macquarie street, Sydney, on Friday 16th March. Mr. Bill Miles, cousin of the bridegroom, acted as best man. The bride was given away by her brother-in-law,   Mr. Clive Colman. 3. 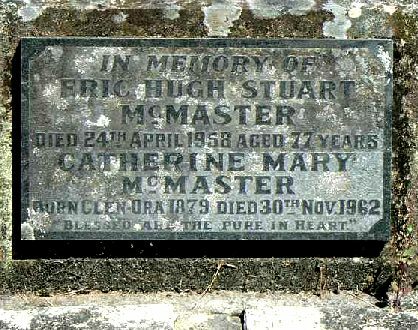 Elliot Eric McMaster was born on 26 Feb 1917 at Taree, N.S.W. Elliott Eric sounger son of Mr and Mrs E H S McMaster Glen Ora, Nabiac. 4. Jean Edith McMaster was born on 10 Jul 1918 at Taree, N.S.W. Sydney Morning Herald, 14 aug 1948. 5. Marion Maud McMaster was born in 1920 (1919? )at Taree, N.S.W. She married Brian George Windross  on 20 Jan 1981 at Nabiac. 6. Alison Flora McMaster was born on 22 Apr 1922 at Taree, N.S.W. She died on 22 Feb 1960 at Taree, N.S.W., aged 37.
and was buried in Feb 1960 at Failford, Failford, N.S.W. Blessed are the pue in Heart"